Philadelphia Bartending School - 5 bartending schools in Philadelphia and New Jersey. We are the only bartending school in the Philadelphia Metropolitan area and the state of New Jersey that are part of Professional Bartending Schools of America. The premier chain of state-licensed bartending schools. Our City Ave. bartending school opened in 1991. 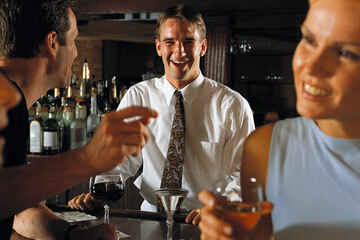 We have been training professional bartenders in the greater Philadelphia area for over fourteen years. We are very proud of the great bartending jobs our graduates have received. Many of our graduates are now managers and owners of some of Philadelphia's best bars! The Mixology Wine Institute of Philadelphia is licensed by the Pennsylvania Department of Education. We view bartending as a professional career and work hard to give our students the knowledge and experience required to be a professional mixologist at Philadelphia's best bars. Mixology Wine Institute locations in the Mid-Atlantic region cover Southeast Pennsylvania, New Jersey and Delaware. There are three locations in the Philadelphia metropolitan area for your convenience: Philadelphia Main bartending school is located on City Ave., Old City Philadelphia bartending school is located on Chestnut Street, and our Cherry Hill, New Jersey bartending school is located at the Barclay Farms Shopping Center in Cherry Hill, New Jersey. In addition, we have a bartending school in Princeton New Jersey on route One south and in the historic district of Bethlehem PA , serving Allentown and the greater Lehigh Valley area. Take the time to check out all of our pages and then TAKE THE NEXT STEP! Request more information on our City Ave. Philadelphia bartending school, or call us today and we will show you how we can help you get started in your new bartending career!